As has been said on so many occasions by so many folk links form the fabric of the Internet. And as most SEO’s worth their weight will tell you links are the key to ranking well. But not his Argolon.com blog. 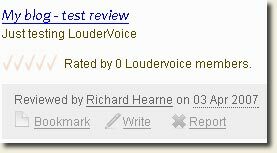 Instead, and I hope he doesn’t mind, I’m going to write up a review of his LouderVoice site. Conor is the creator of LouderVoice a Web2.0 Review platform that let’s users quickly and easily create and find user reviews. 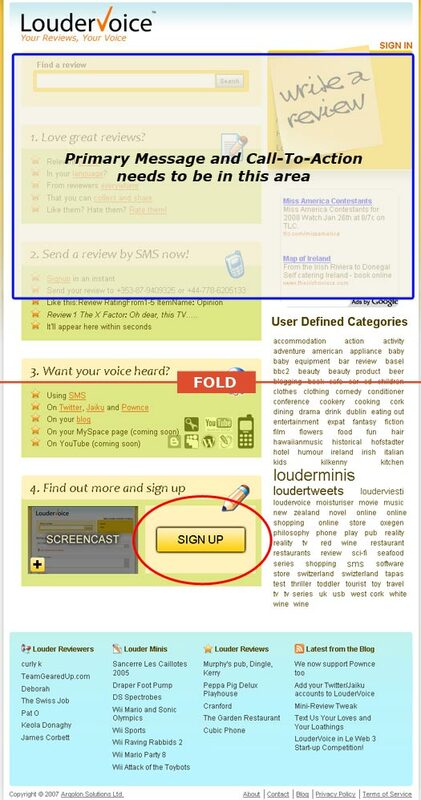 Loudervoice is a great example of building an application on WordPress. But WordPress generally needs a lot of tweaking to get things working smoothly from an SEO perspective. Update: Conor let me know that Loudervoice is built on Turbogears. My bad. But the advice below still holds. The main areas of concern I see are Duplicate Content and Pagerank Distribution. If your site contains a large number of generic objects – in Conor’s case reviews – and you offer functionality which requires login, then very often you’re going to end up with vast amounts of duplicate content and Pagerank leakage. Like many membership sites, you must be logged in to use many functions. So you’re redirected to a login page when you click any of those links. The rating function actually contains 5 different unique URLs, so all in all there are 7 different URLs there that all land you on a login page. Why does this matter? Well, Google cant login, so for every review you end up 7 duplicate login pages all with unique URLs. Multiply that by each review… you get where I’m going. Possible solutions are to block these URLs using robots.txt and/or NOFOLLOW the links. I’d do both personally, but due to the Pagerank distribution (more later) I’d definitely go for the NOFOLLOW in this instance. Other things to watch for are URLs that sort/order different lists. For instance, when you look at a tag page you have the option to sort reviews by rating and date. These too can lead to dupe content issues, and you have to carefully consider how to address such issues. I haven’t spoken to Conor about the goal of the site. I’m not sure if the priority is to get traffic to the Loudervoice site, but given the prominence of the search box I assume so. This is where architecture and Pagerank distribution can be so important in order to squeeze as much Search Engine traffic as possible. In my view sites like this have to push as much link juice down to the primary pages – in this case either the review pages themselves, or the tag page those reviews belong to. The more I look around the more I like the architecture. Actually, more correctly, the more I like the potential for a really good architecture. It’s just perfect for an internal linking strategy based on a slightly modified ‘Third Level Push’ (for a great run-down on this topic see Halfdeck’s post). The basic premise of third level push is that you push Pagerank down to your post pages and out on that tier, but not back up to either the adjacent category pages or the homepage. You do this by funnelling Pagerank. On all tag pages I’d NOFOLLOW the tags in the right-hand column. I’d also NOFOLLOW the louderminis tags IF the tweets carry a link back to the tag page. I’d have to do a lot more investigation before doing this however. I’d do the same with the tags on the people pages. I’d NOFOLLOW all utility links (homepage, terms, about us etc.) and the login link on tag and people pages. 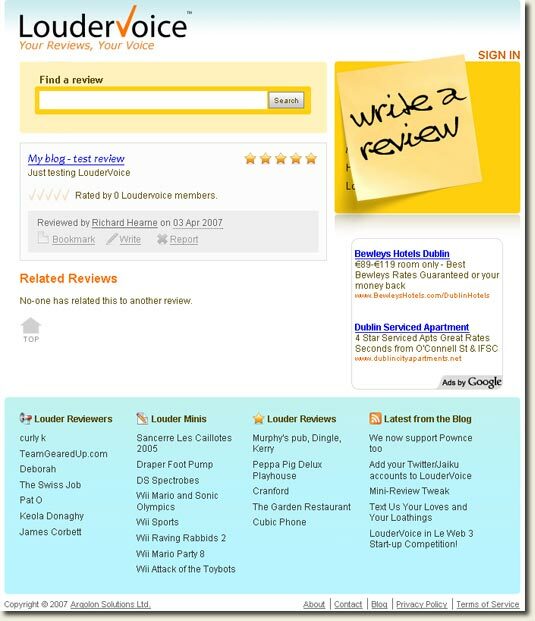 I’d muck about with the links that are published on people’s blogs for rating each review. Could I get targeted anchor text into those links? Some cursory investigation shows that people tend to search for ‘[item] review’ or ‘[item] reviews’ rather than ‘review [item]‘. I’d think about that when it comes to page titles and some internal text. I’d also try to give some subtle hints to reviewers to use just the product name in the review title. Then automatically append ‘review’ to that. The homepage may need some serious surgery. Apart from the messaging (more in a minute) I think it’s important to have a well defined permanent path for spiders to take. This last point might need some elaboration. I think that a good trick here might be to list the top tags rather than all tags up to ‘kitchen’. Then the related tags on each of the top tags pages will funnel Pagerank out. And adding the NOFOLLOWs as per above should mean that Pagerank channels directly to the review pages. Again some thought will hav to be put into this to ensure you don’t end up filling the less popular tags. Final idea from the SEO perspective – add a robots.txt and exclude all that dupe content I mentioned earlier. You also need to NOFOLLOW many of those links, because as we recently found out even pages excluded via robotos.txt can accumulate Pagerank. Robots.txt is also a great way to funnel bots – the addition of a HTML sitemap might also help in this regard. Okay, first off I think Loudervoice has to lose the Adsense. I know there is no other source of direct revenue, but nothing puts me off than such in your face Adsense blocks. Now since I’m moving into conversion optimisation in just a few days it makes perfect sense to suggest that Conor redesigns his homepage completely and runs some split testing to see what difference this could make. Personally I’d look at removing at least 60-70% of the copy and replacing with strong imagery. I’d pay a lot of attention to the call button. Also the header and sub heads. And I’d remove/relegate the post-it image and the tags from the right hand column. But I wouldn’t rely too much on gut feelings here – I’d put everything to the test and let your visitors decide what works best. Afterall, they’re the reason the site is there. I think Loudervoice is a great idea. I’d like to see the architecture come along and perhaps see more community features (which I didn’t discuss, but alerts and subscriptions come to mind). But perhaps most importantly I think the messaging could be greatly improved. Maybe the homepage shouldn’t try to explain in detail what Loudervoice is – get people to sign up and find out for themselves. Just an idea. As a final parting gift, and to apologise for the loo..ong delay in getting to your site Conor, I’d be happy to help you set up the tests if you get someone to redesign a few homepage variations for you. If anyone actually reads down to here I’d love to hear your views – leave a comment below. Thanks for this awesome post Richard. I had no idea you would dig in with such depth. This will be of huge benefit to us with our V2 revamp in January. Look forward to seeing you’re revamp.